Avalon 2 – Quest for the Grail online slots casino game is all about King Arthur and his search for the Holy Grail. If you like mystical mystery you’ll love this game with intrepid soundtrack and sparkling crisp and lifelike symbols. Avalon 2 is a reprise of Avalon but with lots of bonuses on offer as you follow the path towards the grail, you’ll have a new experience. One of the original slots developers, Microgaming is based on the Isle of Man. Since 1994, they have grown in stature and have over 800 different slots which are played across the world and of a very high graphical standard. In 2010, they launched an integration platform called Quickfire Games which enables other game developers to offer their games through Flash and Mobile platforms. 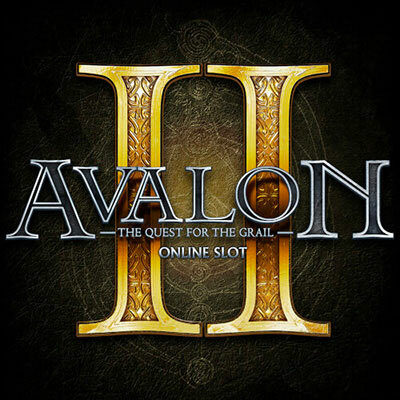 Avalon 2 – Quest for the Grail online slots has a 5 reel, 3 line, fixed 243 payline format. There are the usual playing cards and then character cards - the Black Knight, Morgan, Guinevere, Merlin and Arthur. The grail goblet is at the top end of the paytable. Click ? to view the rules and View Pays to view the paytable. Click Bet to select the number of coins you want to bet (from 1 to 5) and the value of the coins (from 0.01 to 0.20) you want to bet with. You can set up Autoplay, selecting the number of spins you want and your stop settings, and then clicking Start. Alternatively, spin manually by clicking Spin. If you want to stop spinning, just click Stop. AVALON LOGO – substitutes for all other symbols except the lady of the lake, scatter and bonus symbols. LADY OF THE LAKE – expanding wild appears on reel 3 only and substitutes all other symbols except the scatters..
GRAIL GOBLET – three, four or five of these trigger the bonus games which lead you through different bonus games towards the elusive grail and also increase your bet by multipliers x5 for three, x20 for four and x100 for five. These games offer different virtual experiences and bonuses. For example, free spins, games to pick hidden prizes, matching games and gambling games. Avalon 2 – Quest for the Grail online slots casino game is a smorgasbord of fun. With its theme of mystical mystery and constant searching for the elusive Holy Grail, you’ll be mesmerised by the quality of the graphics and the variety of game options through the extensive number of bonus games available.